Sun and wind are important sources of renewable energy, but they suffer from natural fluctuations: In stormy weather or bright sunshine electricity produced exceeds demand, whereas clouds or a lull in the wind inevitably cause a power shortage. For continuity in electricity supply and stable power grids, energy storage devices will become essential. So-called redox-flow batteries are the most promising technology to solve this problem. However, they still have one crucial disadvantage: They require expensive materials and aggressive acids. 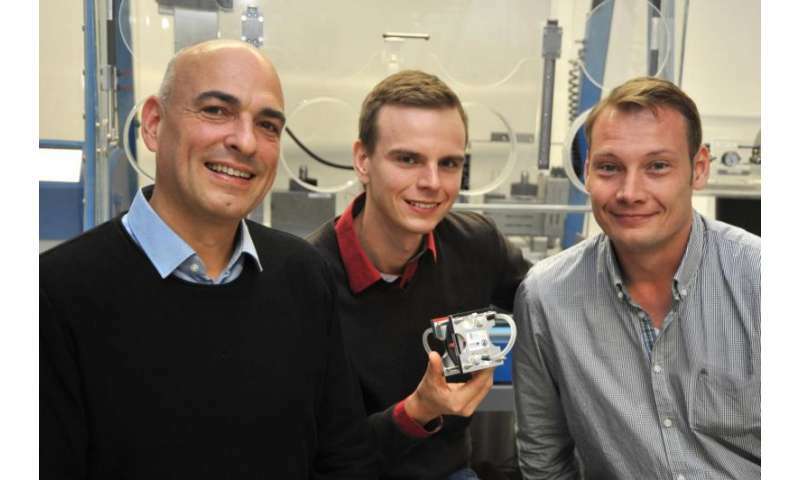 A team of researchers at the Friedrich Schiller University Jena (FSU Jena), in the Center for Energy and Environmental Chemistry (CEEC Jena) and the JenaBatteries GmbH (a spin-off of the University Jena), made a decisive step towards a redox-flow battery which is simple to handle, safe and economical at the same time: They developed a system on the basis of organic polymers and a harmless saline solution. "What's new and innovative about our battery is that it can be produced at much less cost, while nearly reaching the capacity of traditional metal and acid containing systems," Dr. Martin Hager says. The scientists present their battery technology in the current edition of the renowned scientific journal Nature. In contrast to conventional batteries, the electrodes of a redox-flow battery are not made of solid materials (e.g., metals or metal salts) but they come in a dissolved form: The electrolyte solutions are stored in two tanks, which form the positive and negative terminal of the battery. With the help of pumps the polymer solutions are transferred to an electrochemical cell, in which the polymers are electrochemically reduced or oxidized, thereby charging or discharging the battery. To prevent the electrolytes from intermixing, the cell is divided into two compartments by a membrane. "In these systems the amount of energy stored as well as the power rating can be individually adjusted. Moreover, hardly any self-discharge occurs," Martin Hager explains. Traditional redox-flow systems mostly use the heavy metal vanadium, dissolved in sulphuric acid as electrolyte. "This is not only extremely expensive, but the solution is highly corrosive, so that a specific membrane has to be used and the life-span of the battery is limited," Hager points out. In the redox-flow battery of the Jena scientists, on the other hand, novel synthetic materials are used: In their core structure they resemble Plexiglas and Styrofoam (polystyrene), but functional groups have been added enabling the material to accept or donate electrons. No aggressive acids are necessary anymore; the polymers rather 'swim' in an aqueous solution. "Thus we are able to use a simple and low-cost cellulose membrane and avoid poisonous and expensive materials", Tobias Janoschka, first author of the new study, explains. "This polymer-based redox-flow battery is ideally suited as energy storage for large wind farms and photovoltaic power stations," Prof. Dr. Ulrich S. Schubert says. He is chair for Organic and Macromolecular Chemistry at the FSU Jena and director of the CEEC Jena, a unique energy research center run in collaboration with the Fraunhofer Institute for Ceramic Technologies and Systems Hermsdorf/Dresden (IKTS). In first tests the redox-flow battery from Jena could withstand up to 10.000 charging cycles without losing a crucial amount of capacity. The energy density of the system presented in the study is ten watt-hours per liter. Yet, the scientists are already working on larger, more efficient systems. In addition to the fundamental research at the University, the chemists develop their system, within the framework of the start-up company JenaBatteries GmbH, towards marketable products.